American Civil War naval, with a number of boats messing about on the water of the Mississippi. The first couple of games featured Paul's Ironclad rules before the third bigger game with Martin's naval rules from Cheer Boys! Cheer!. A couple of small ships encounters using two ships per side and similar stat lines. First was a bit lop-sided with the Union managing to get the advantage early and inflict enough damage to both Confederate ships to effectively put then out of action before any real damage could be done in return. 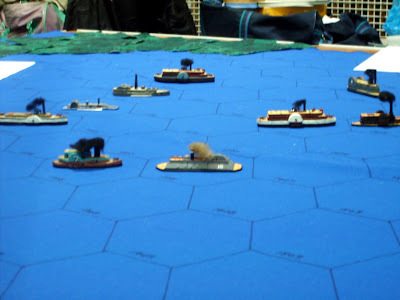 Switched sides for the second game which was much closer, The confederate ships were both one damage away from sinking and were retiring of board when a final shot against the smaller of the Union ships caused it to sink, turns out that they were as badly damaged as we were. 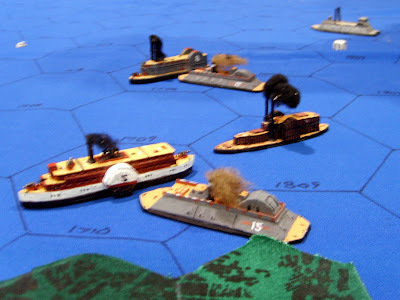 The final game was a bigger affair and, I believe, based on the actual Battle of Plum Point Bend, where a force of wooden Confederate ships and paddlesteamers tried to surprise a smaller but much heavier hitting Ironclad Union force while it was at anchor. Unfortunately for the Confederates the Union ships eventually managed to fire up their boilers and get on the move quicker than the Rebs anticipated. Even the vulnerable Mortar Platform, stuck in the middle of the river like a sitting duck, managed to inflict damage; holing a ship at close range after it's victim missed it's attempted ram on the platform. 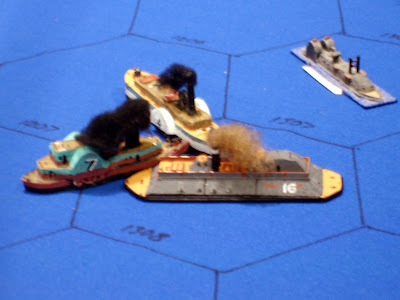 The numerically superior Confederates decided to try ramming as it main tactic, and in one instance succeeded - in ramming one of it own vessels. 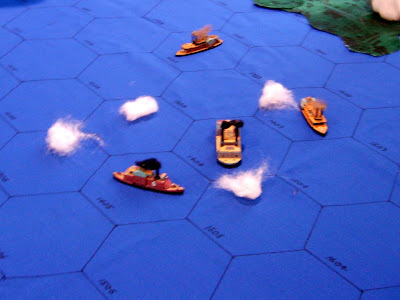 The Union decided to try some ramming of its own and managed to hit a couple of the Confederate ships, as well as launching some close range broadsides against them. The critically damaged Confederate ships grounded themselves, and their surviving companions turned and fled, making good of the rivers currents to escape.